Home starts with Sarah’s favourite kitchen tips and tricks which includes a tip for setting the table for guests before you start cooking. I usually do my table laying in between the cooking, when I have to wait for something to happen while cooking. This is followed by a kitchen starter kit and a few basics which include information on how to grease tins and a recipe for basic buttercream icing. The recipe section in the book, subtitled, Food From My Kitchen starts with brunch. I am so going to try the bacon and clementine marmalade (p15) as well as the ricotta hotcakes (p19). The grapefruit and star anise lemonade (p28) will make an appearance this summer in my kitchen at some stage. Sarah then moves on to salads and as soon as I find broad beans I will try the courgette ribbon and broad bean salad (p39). The sticky ginger prawn salad (p40) also caught my eye. Then we have a section on soups where the roast chicken and fennel soup (p47) sounded delicious. I would wait for winter to make the arrabbiatta seafood soup (p52). This is followed by snacks where I really need to try the salt and pepper squid (p62). In the chapter on meat the sticky ginger and hoisin pork (p76) stood out, as well as the beer and brisket pies (p84). If I could find goat I would try the slow-cooked goat stew (p89). I made the Spanish-style roast chicken (p106) from the chapter on poultry, which was really delicious. For something different I would make the roast chicken and pea lasagne (p111) from the recipes covering pasta. After having to devise my own recipe for baked risotto I see Sarah has one for baked pumpkin risotto (p118). The following chapter covers seafood and next time we get fresh mussels I will make the mussels in Thai red curry (p124). Home has the South African version of lobster roll in the form of prawn bunny chows (p127) which I will adapt to make with crayfish during season. And on the next cold night if I can get fresh fish, I will try the fireside fish curry (p131). Interestingly in the dessert section is a recipe for Pimms plums and peaches en papillote (p140). I think this technique would make a great talking point at the end of a dinner party. For the next lot of summer holidays I will turn my hand to the pink gin fizz popsicles (p161) as they sound perfect to combat the heat. Home ends with baking and for workday breakfasts the quick thyme, feta and black pepper muffins (163) sound perfect. For #ISW2016 I might make lemony scones (p164). These are paired with a quick berry and thyme jam (p165) which reminds me of my own recipe which I’ve not made for a while. The photographs do not overwhelm me at all! What stands out is the number of recipes where Sarah features in the photograph. Out of the 70 recipe photographs, only 40 of them don’t show Sarah. She also features on a double page collage, the contents page, my favourite kitchen tips and tricks page as well as the kitchen starter kit page. 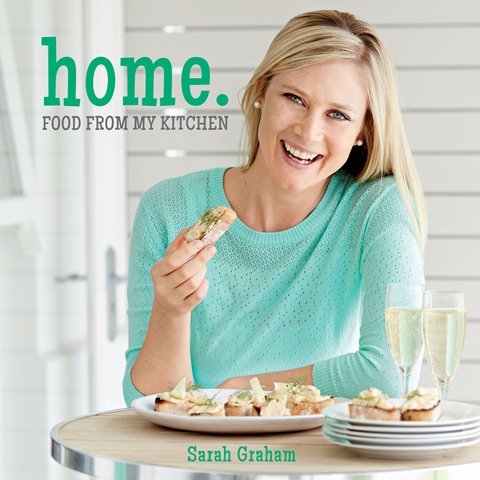 To see a video of Sarah Graham: Home – Food from my Kitchen, click here. I have to agree with you, I love to see photos of the finished produce. I don’t need to see the author in every photo. Front cover and back sleeve is enough for me. I will be most certainly be trying some of these as soon as I get my hands on the book. Yum! This recipe looks delicious! What a great cook book! Thanks for sharing!! Hi Tandy, looks like a great cookbook, everything your listed sounds delicious! This book looks really intriguing! To be completely honest, I won’t make a recipe unless I have a picture of the final dish. It just boosts my confidence and serves as a map of sorts ~ I want to know where I am going! Spanish chicken looks so tasty. Love that red onion. The Spanish chicken looks lovely. Spanish food has all my favourite flavours in it. Lots of delicious recipes to review. 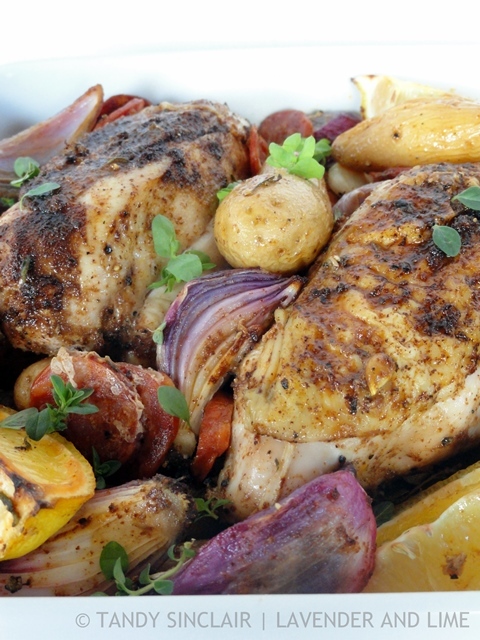 Your Spanish chicken looks tasty.